Louisiana Offshore Fishing Charters, a company providing fishing charters out of Venice, Louisiana, announced the launch of its new website. Interested fishermen can now book professional, fully-equipped fishing charters in the Gulf of Mexico via an easily-accessible online booking system. 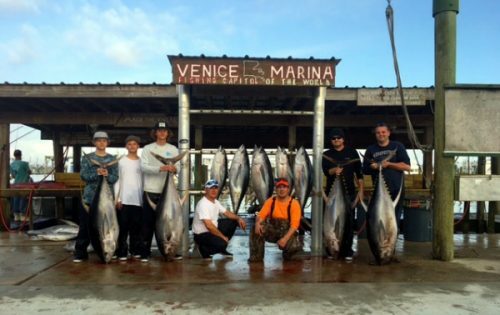 Louisiana Offshore Fishing Charters, a fishing charter company located in Venice, Louisiana, launched a new website allowing interested fishermen from across the country to book an offshore fishing trip on one of their fully-equipped charter boats. Led by experienced captain Troy Wetzel, Louisiana Offshore Fishing Charters provides daily and overnight charters for clients looking to catch yellowfin tuna, blackfin tuna, marlin, Mako sharks and many other species. Charter fishing is one of the most popular forms of recreational fishing, offering the opportunity to catch trophy species under the guidance of experienced fishermen. Venice, Louisiana is a popular launch site for many searching for New Orleans fishing charters. Many prefer it for the ease of access to the huge fishing supply of the Gulf of Mexico. The new website offers interested fishermen the possibility to book their fishing trip months in advance, choosing one of the multiple boats and the length of the trip. Daily and overnight fishing charters are available, with the schedule being easily accessible through the home page. Fishermen looking for lodging can use the accommodation provided by the Louisiana Offshore Fishing Charters. The company provides 3-bedroom/2-bathroom private rental units which can accommodate up to eight guests, each unit being fully furnished and offering a fully equipped kitchen, satellite TV, barbecue pits and other facilities. Interested parties can find more information by visiting http://www.captaintroywetzel.com.